A small Grower Producer since the 60s with good, solid (and tasty) value priced wines. 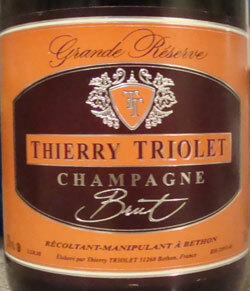 Thierry Triolet is a Grower Producer who has been producing his own Champagne, from growing and nurturing the vines, harvesting, pressing, blending, and aging, since the 1960s with the help of his wife Frédérique. They have 11 hectares of vines in Breton, a village in the south of Côte de Sézanne. The Côte de Sézanne is next to the better known Côte des Blancs, and both areas are known for their Chardonnay. Geographically, the Côte de Sézanne is an extension of the Côte des Blancs with a very similar terroir. His 11 hectares of vines in the villages of Bethon, Montgenost, and Villenaux-la-Grande, are 80% Chardonnay with 15% Pinot Noir and 5% Pinot Meunier. He makes 40,000 bottles and year and sells some grapes including to Krug and Billecart Salmon. Minimal intervention is practiced and fermentations take place with natural, indigenous yeasts from the skins of the grapes. Wines include the Brut Non Vintage, 80% Chardonnay and 20% Pinot Noir, the Grand Reserve, 100% Chardonnay making it a Blanc de Blancs (although the label on my bottle doesn't mention that) and aged 3 years on its lees, the Brut Vieilles Vignes Vintage Champagne, made entirely of Chardonnay and from a parcel of vines that are 40+ years old, and a Rose which is 55% Chardonnay, 30 Pinot Noir, and the rest half still Pinot Noir and still Pinot Muenier. They refer to their Rose as "un vin de gourmandise" which I translate to a big and tasty wine. They also make a Carte Noir, 60% Chardonnay, 35% Pinot Noir et 5% Pinot Meunier, in both Brut and Demi-Sec (sweet) varieties. First bottle was slightly off with some bitterness on the end and rated B-, but a good bottle is much better. Very good as I like this producer and have a few more bottles. The nose is fresh cut apples, spicy minerals, and chalk. With air, apple peel. A lovely nose! The palate is similar. Apple, clear apple cider, white grape juice. A little orange and lime citrus and some minerality with air. This is a big and robust wine and handles food well. Similar to the 100% Chardonnay Grand Reserve Brut below but bigger at least in part due to the addition of 20% Pinot Noir. I think I may like the Grand Reserve slightly better but will reserve judgment. I definitely like them both a lot! Pretty big and bold for a Chardonnay based wine, with applesauce and baked apple. A very nice mouthfeel. As it warms some lemon and lime yet without the bitterness/tartness. Not a blockbuster, but a good solid value, especially at the US$35 I paid. Certainly as good or better than many big names at higher prices.